Nothing brings me greater joy than cracking open a crisp, new book. I take that back, I love old ones, too. As long as it’s a book, and about something I enjoy, it’s a treasure. Over the past few years our family has been collecting books that reflect on and share the beauty of the Waldorf philosophies we’ve come to hold so dear. These books vary in nature, from imaginative picture books without words, to whimsical picture books with words, to ones that fall into the more informative and inspirational category, just for us parents, with only words. All are wonderful; all are worthy. Some of these books are of the cardboard variety, wonderful for even the tiniest of hands, while others have been sails in our lives, providing steady direction, motivation, and intention as we go about our days and learn from season to season. Without getting too much into the how’s and why’s of why we’ve chosen Waldorf ways now, I thought it would be helpful to share some of the books we have in our library. I keep most these books in a woven basket with a sturdy handle, one: because it keep them together, and two: so we can take them with us wherever we’ve decided to settle down. Sometimes it’s the breakfast nook, other times, the backyard or park. 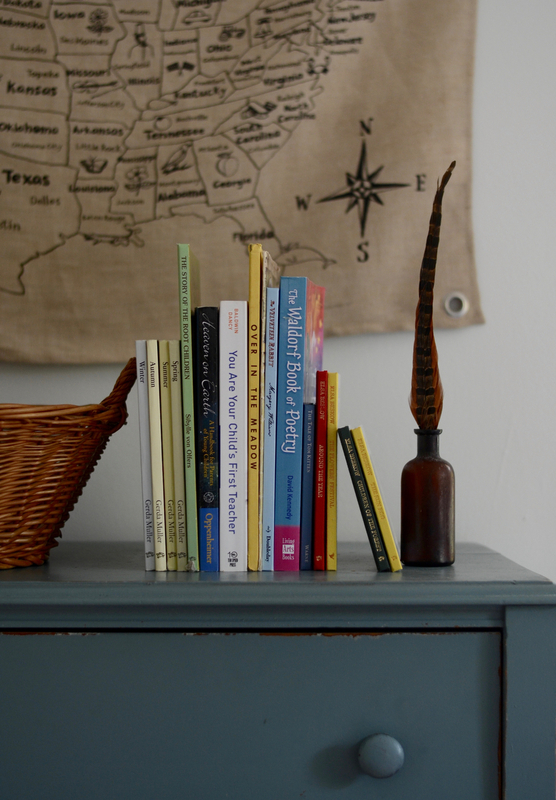 Wherever it is, we’ve got our basket full of books with material to suit each of our curiosities. Although I’ve read most of the adult-friendly books in our home, I tend to keep my favorites close. I gain so much by having them near so I can flip and ponder throughout my day, if a moment lends itself to flipping and pondering. But honestly speaking, it’s quite rare that I’ll get to read a full page without interruption. That being said, having tangible reminders and inspiration on hand, right there at my fingertips, is both encouraging and helpful. In this way, books comfort me, their respective authors, like dear friends. Below are the ones we love most, the ones in our basket. Although I find each of these wonderful in their own respective ways, I encourage you to take your time in building your library, rather than going out and getting all of these titles if you do not currently own them. For one, that would be expensive! But more so, it would be overwhelming and take away from the beauty that is in getting and soaking up a new book. Each of the author’s work below lends itself beautifully to Waldorf methods and practices. Start with one, and gradually keep adding more. The holidays are a nice time to gift books to your little ones, we follow the want/need/wear/read gifting philosophy, and perhaps that might be a nice way to introduce some new titles!? Regardless of how and when you start adding these to your library (if at all!) take it slow. Savor each one. And enjoy them, either along in the comfort of your home, or near your babies. They are beautiful, each and every one, and I am happy to share the magic they bring with you! All Books by Elsa Beskow | Elsa Beskow’s books are an absolute delight. Each one is full of whimsical words and illustrations that warm the heart and root us to the seasons. 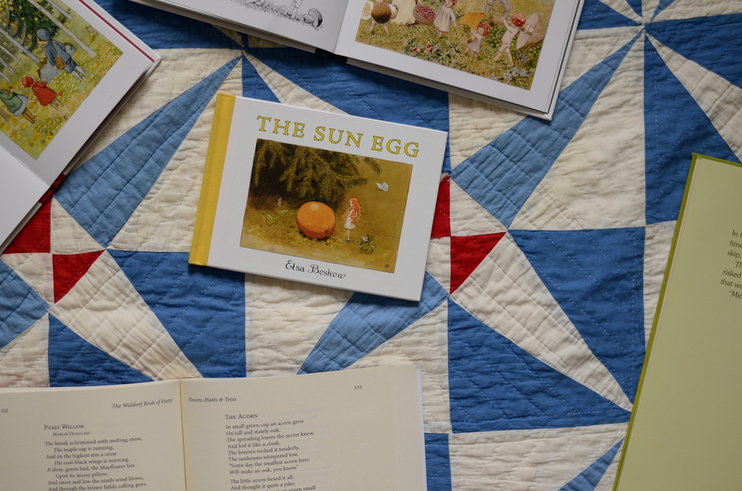 Her book, Around the Year, a favorite in our home, offers monthy poems and other sweet rhymes that guide us through the days, weeks, and months throughout the year. The characters in her books are full of intriguing forest magic, and even more special, is how they tell beautiful stories that connect us to the Earth in a gentle and respectful way. I also recommend, The Flowers’ Festival, Children Of the Forest, The Sun Egg, and Princess Sylvie. The Seasons Board Books (Spring, Summer, Autumn, Winter) by Gerda Muller | This collection of seasonal books is one the kids gravitate towards again and again. They go with us to church and brunch most Sundays! There are no words in these books, but rather, carefully crafted illustrations that invite you and your little ones to get creative and storytell together. Each new page shares a seasonal scene or two that set the stage for a tale. We also play eye spy with them, and enjoy talking about the scenes we see. The Story of the Root Children by Sibylle von Olfers | I was given this book by my birth grandmother, and that, among so many other reasons, it’s very, very dear to me. I read it to the kids every month or so, and each time, I learn something new. This story is one about children of the Earth who live underground and prepare for the growing season of springtime. They craft and sew beautiful outfits with Mother Earth, and when the time is right, make their way up to the sunshine where they grow into the most exquisite spring flowers. The seasonal metaphors in this book are so moving and lovely. I also recommend The Story of the Snow Children. All Books by Beatrix Potter | We have several books, both long and short, from the enchanting world of Beatrix Potter. The words she strings together while she tells tales about rabbits and squirrels and kittens and other small creatures, are full of warmth and charm. When I was little I dreamt of a world very much like the one Potter shares, and to revisit this magical world with my little ones is very sweet. The Tomten by Astrid Lindgren | The kids got this book for Christmas last year and it quickly became a favorite before bedtime. It’s about a friendly little troll who lives in the Swedish countryside and visits in the nighttime. Again, it’s full of magic and wonder, perfect for the winter season approaching. The Waldorf Book of Poetry by David Kennedy | This collection of poems is a wonderful resource to have at home. The themes it covers ranges from the natural world, to history, to numbers, to Shakespeare. It contains poems that connect us to whatever it is we are learning about, and I love the wealth of inspiration it offers. Simplicity Parenting by Kim John Payne | A wonderful resource for simplifying the contents of your life, your parenting habits, and the way you go about your days. This book, my most tattered and well-loved, keys in on the beauty and power of less to make our homes, our rhythms, our souls, and our relationships both calmer and more secure. Heaven On Earth by Oppenheimer | This book is a handbook for parents and springboard for creativity that outlines how we, as caregivers of young ones, can give our children a slow and meaningful childhood. The Soul of Discipline by Kim John Payne | Piggybacking off of his book Simplicity Parenting, this one guides parents through calm, warm, and firm discipline techniques and guidance from the toddlerhood stage to the teenage years. You Are Your Child’s First Teacher by Baldwin Dancy | Written by a Waldorf teacher, this book travels through the different stages of childhood development, offering wisdom, resources, and support, with regard to gentle, practical, empathetic child-rearing. I am currently in the middle of this, and have found it to be very informative and inspiring. No-Drama Discipline by Siegel & Bryson | From the authors of The Whole-Brain Child, this book delves into ways one can create calm out of chaos when discipline young ones. I appreciate that this book offers real-life applications, and goes into the simple behavior redirection techniques. 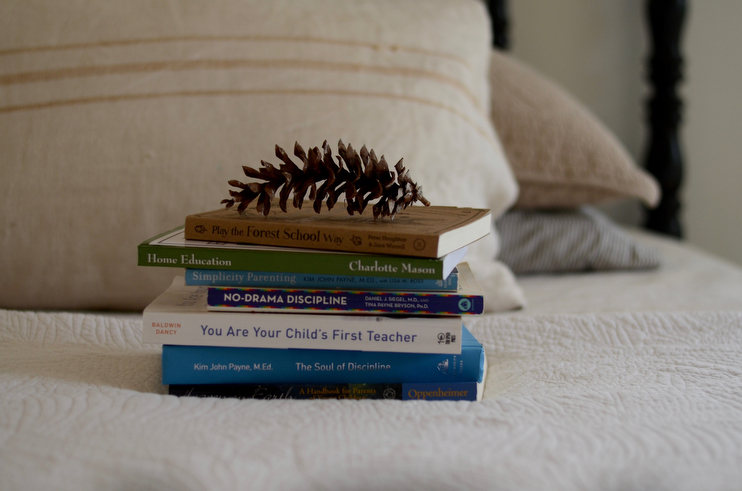 Home Education by Charlotte Mason | New to my book basket, this homeschooling classic is all about Charlotte Mason philosophies and how one can apply them at home. Play the Forest Way by Houghton & Worrall | This playful read is chock-full of ideas for a nature-inspired life or curriculum at home. It details woodland games, crafts, and skills for adventurous learners, and gently urges us to get outdoors and create in nature – the forest way. This book also touches on some basic survival skills, along with other handy information one may need if camping or spending a good amount of time outside. What books do you have on your Waldorf shelf? Like you, we are constantly adding more resources, learning more grounding techniques and approaches, and opening ourselves up to the grace and beauty that this gentle way of living provides. Waldorf is about what is good, what is beautiful, and what is true, and each of these titles are just that. Enjoy, dear reader, enjoy!